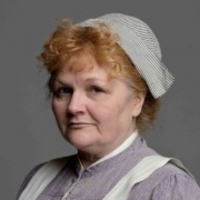 Lesley Nicol (born 1953), to a mother who had worked in television, Lesley Nicol was a shy 16-year-old at St. Elphin's Boarding School in Derbyshire when she expressed a desire to go out and see the world - not, she recalls, to be an actress but to kiss boys. She went to a technical college in Manchester to study for her 'A'-level examinations and, whilst there, she got involved with the Manchester Library Theatre. She was paid a pound a week to play a tiny role as a 12-year-old boy in Shaw's 'Androcles and the Lion'. It was her first and last role there but she was encouraged to apply for entry to London's Guildhall School of drama, from where she graduated in the early 1970s. For several years Nicol was best known as a stage actress, particularly in musicals, appearing in Mama Mia, Our House, the show based on the hit songs of Madness, and as Little Buttercup in a revival, with Gary Wilmot, of HMS Pinafore. She was also the original stage neighbor, nosy Auntie Annie, in the play East Is East at the Royal Court, reprising the role in the 1999 film version - surprisingly her movie debut given her length of acting experience. She has appeared in guest roles in numerous television series and in the mid-2000s played a character called Aunt-Tea in a short series of commercials for Tetley tea. 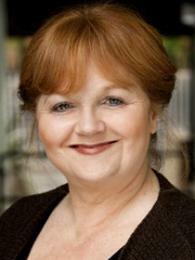 Appeared in the stage version of _East Is East (1999)_ (qv). Was going to play The Customer in Doctor Who:Dragonfire but had to drop out.